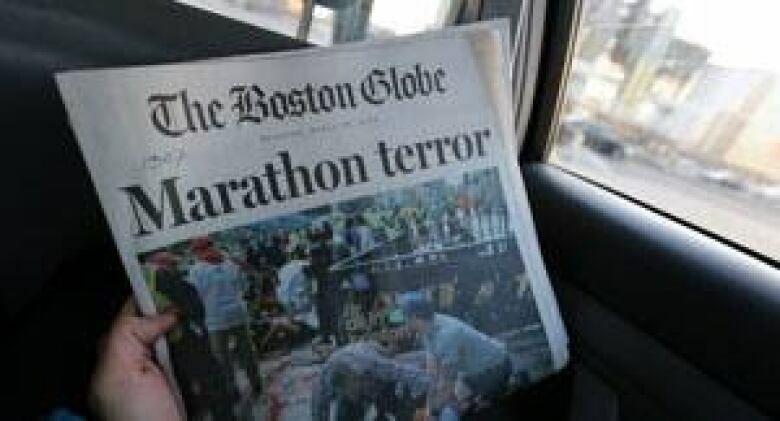 CBC reporter John Rieti is in Boston to speak with Canadians who took part in the Boston Marathon, the site of two deadly bomb explosions on Monday. Almost all the seats at an American Red Cross office in downtown Boston were full on Tuesday afternoon, and among those waiting to donate blood were two Canadian sisters. 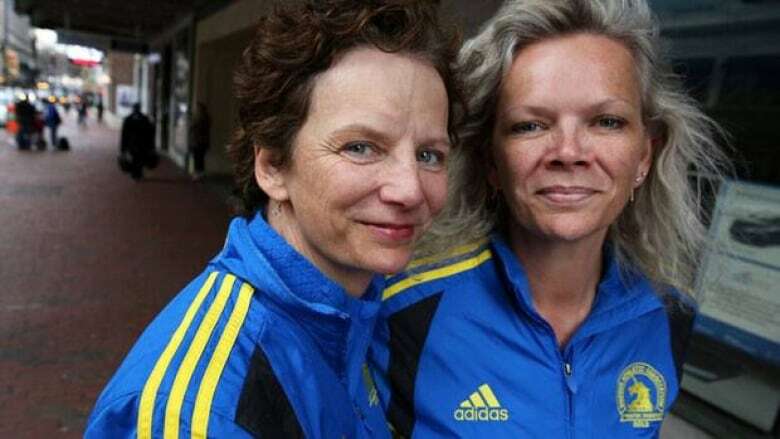 Christina and Virginia Engel, from Vancouver and Calgary, respectively, were more than a kilometre from finishing the Boston Marathon on Monday when the twin explosions shut down the race. "We had no idea what was happening," Virginia told CBC News. LIVE: Read the latest updates on the Boston Marathon attack investigation. This morning, the horror was clear. When Christina heard doctors describe the blast injuries suffered by many of the victims, she decided to donate blood — hers is the rare AB-positive type. "It’s the least I can do," Christina said. The sisters made two trips to the clinic because it was too busy during their first attempt at noon. During the second visit, Christina was saddened to find her hemoglobin levels are too low to give. The pair is set to fly back to Canada today, but Virginia said they wanted to help the devastated Boston community before they left. "The locals are having a worse time with it than we are," Virginia said. "They keep apologizing to us … it reminds me of something Canadians would do." Shortly after the sisters were forced from the race route, Virginia says, a Boston woman invited them into her home. When the woman found out the sisters were Canadian, she wrapped them up in a hug — turns out she was, too. The Engels left flowers today on the woman’s doorstep. 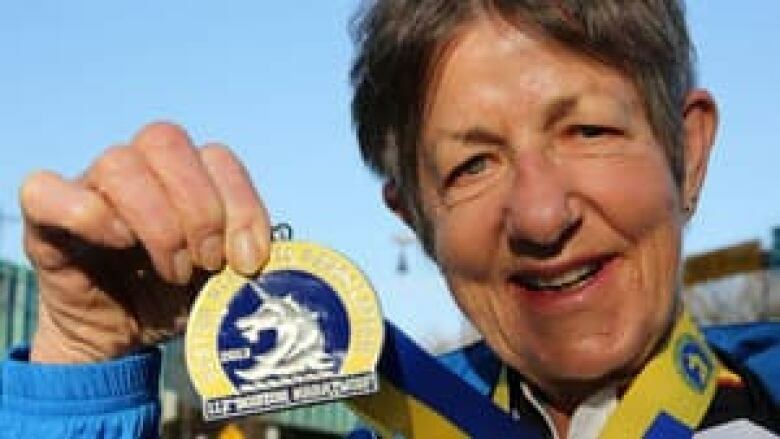 Canadian runner Liz Borrett had just had a silver medal hung around her neck when the first blast rocked the Boston Marathon's finishing area. At first, she thought it was "part of the celebration," but a second blast sent runners and race officials scrambling. "That’s when I realized this is not normal," Borrett told CBC News at her Boston hotel on Tuesday morning. "People were in shock, disbelief … once there were injuries obvious, people went into self-protection mode," the Kelowna, B.C., resident added. After the explosions, Borrett, 74, wrapped herself in a race blanket, gathered her belongings and slowly made it away from the horrific scene. As she left, emergency vehicles sped by. Many runners and fans were screaming. Nobody knew exactly what had happened at the finish line. Now that the full extent of the chaos is clear, Borrett doesn’t like to think about what would have happened if she had run slower. She finished in four hours and 30 seconds, placing second overall in her age group, just nine minutes before the explosion. Borrett said she’s also lucky her two sons, Berkley and Roger, chose to follow her along the route on bicycles, instead of waiting on the street near the finish line, where scores were severely injured and at least three people were killed. This was her first Boston Marathon, a race other runners told her was a "necessary" event to compete in. And after running past mile upon mile of race fans — marathon organizers estimate some 500,000 people lined the route — she believed it. Now, Borrett worries about how the Boston Athletics Association will pull off next year’s marathon. "What does it do to the organization?" she said. "There are people who won’t come." Borrett’s top finish has already qualified her for next year's race, and says she would go "without fear" if it's held again. "What can I do to change this?" she said. "It’s just a tragedy." Canadian Erin Giles, 34, who now lives in Denver, Colo., was running her first Boston Marathon. She finished in three hours and 51 minutes, far behind her normal pace, but she was off the course and back at her downtown hotel when the explosions went off. "I honestly didn’t think anything of it at first," Giles said. In her room, she switched on the TV to see what happened. "It was on every single channel … then it reminded me of 9/11." It’s an easy comparison: as Giles picked her way through the crowded downtown core on Tuesday, she passed heavily armed police officers and soldiers. A military Humvee whipped around a corner. Sirens sounded often. 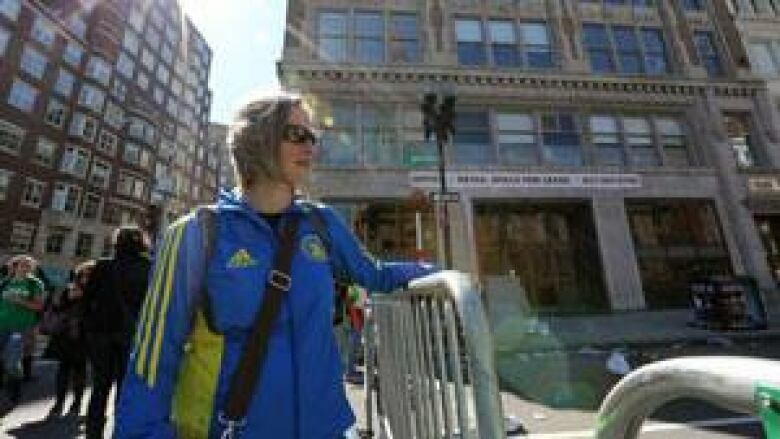 On Boylston Street, where the explosions took place, Giles took a long look at the empty streetscape still littered with empty Gatorade bottles and other hastily discarded race gear. She said the attack won’t stop her from telling her friends to do the race in the future so they can experience the running "rite of passage" of Boston’s hilly course, with fans offering up high-fives along the entire route. "Running this race was such a great experience," she said. "I can’t imagine people not doing it because of this." Dave Emilio and Nir Meltzer, both with the Toronto Beaches Running Club, were part of the steady stream of runners picking up their bags from the marathon's collection area, on a street adjacent to the site of the explosions. They both ran personal-best times, but said they had completely forgotten about their runs today and were happy to be unaffected by the attack. Emilio said the Americans he's spoken to are already showing a lot of resilience and vowing to come back next year. The tragedy makes them want to do it even more, he said. "Running is an international community," Nir Meltzer said. "Everyone wants the best for the next person. We just don't understand why anyone would do this."